Our God is a God Who speaks things into existence by faith. He waits for us to do the same and blesses everybody on earth according to what He hears from them. Today, there are things that are lacking in some people’s lives because they have failed to act in faith. This woman had a devil-possessed daughter, demon possessed. This woman had heard about Jesus. She was a Gentile woman who had come crying, asking for mercy. Notice the beginning of the next verse. children are still devil possessed, and they’ve been that way for a long time. And those children will probably stay that way and go to hell if their parents don’t change. Does this apply to you? Jesus loves you too, but He knows if you’re a flake or not. Even if you’re saved, Spirit filled, and love God, He won’t talk to you much because you fail to put first things first. total blank. It’s what I call praying for something for years and never receiving it. Jesus’ disciples even came over to Him and wanted to send the woman with the devil-possessed daughter away. They were wild. Do you remember in the Bible where blind Bartimaeus began to cry out to Jesus for mercy? Even the crowd told him to be quiet. (Luke 18:39.) Sometimes the disciples were like you and me. They weren’t completely with it. I’ve got news for you. The Lord Jesus Christ is not like you or me or Peter or Paul or that pastor or evangelist you know. He doesn’t think like we do. We’re supposed to think like He does. And once you get to know Jesus, you’ll find out something real quick: He is not interested in sending anybody away if they need help, but He is interested in teaching them the truth because He knows the truth will make them free if they believe it. (John 8:32.) If you don’t believe it, you can remain as you are, but if you believe it, it will make you totally free. If you’re not getting victory, then you had better change. God isn’t going to change. He remains the same all the time. Through divorce He remains the same. She changed her approach. This time she began to worship Him. She wasn’t asking Him, “Why don’t you help me? Why don’t you have mercy on me?” Don’t come whimpering to Him all the time, telling Him all your troubles. He already knows all your troubles. Spend your time with Him worshipping Him. When was the last time you went before the Lord and just began to worship Him? I worship Jesus lying down, standing up, walking, riding in my car. I worship Him morning, noon and night. I make my worship of Him a way of life. 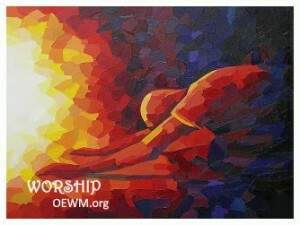 Just sit there in your living room sometime and begin to worship the Lord. “Won’t my family think I’m strange?” you may ask. If you’ve never done it before, they will. But if you’ll do it morning, noon and night for about two or three months, they won’t think it’s strange. Besides, people who worship Jesus aren’t strange. It’s the people who don’t worship Him that are. You’re supposed to worship Jesus. It’s normal. Notice, in verse 26, God puts the woman through a test. He wants to know if she is really sincere and really believes. In those days Gentile people were known as dogs in the eyes of Jews. It doesn’t sound too good. I’ve seen some flaky dogs, and I’ve seen some cute dogs, but I don’t even want to be called a cute dog. But that is what Jesus said. He called her a dog! When He looked down on her and saw her keep on worshipping Him and telling Him, “I’ll eat all the crumbs I can get,” Jesus was so impressed. Her truth and sincerity moved Him. Can you imagine Jesus telling a human being that they have great faith? If God had told me I had faith to please Him, it would so thrill me I couldn’t stand it. I would probably run around the block. If Jesus were to tell me I had great faith, I would probably turn a flip in the middle of the air. It’s called putting first things first. Have you been putting first things first lately? Have you been worshipping God? Let me tell you something. When you put first things first, you’ll not only be healed, but you’ll hold on to your healing. When you put first things first, your devil-possessed children will be saved because the Spirit of God will sweep into where they’re living and drive all the devils out of them. evidently she got home within sixty minutes or less. The Bible says within sixty minutes the daughter was made completely whole. Everything was done by the Spirit of God because a mother was on her knees, worshipping Jesus and refusing to quit. She refused to quit. She was determined to worship Him. If you’ll worship Jesus every day and sell out to Him, I guarantee you that the Spirit of God will go visit your children and drive the devils out of them. I’m a perfect example. I ought to know because for three years my daughter was on dope, and I couldn’t get her off. She wouldn’t listen to me or any other human being. I was just crying out and praying for mercy for my daughter. Why? Because she already had five or six little friends that had been buried in Cleveland, Tennessee, because of overdosing. hell because I’m praying for her in Jesus’ name. I’m praying that God’s power will go visit her wherever she is at, Playmate Club or wherever. I prayed for three years, and one night she looked up at the ceiling of the Playmate Club and all of a sudden part of the ceiling turned into my face, and she jumped up and ran out of there. That supernatural experience along with the angel who visited her in her room were enough to scare the devil out of her. This angel that God sent was about as big as two men. When you’re as big as two men and you’ve just come from heaven, you have the glory of God on you, and you don’t have to preach any sermons. You don’t have to sing any songs. You don’t have to say any prayers. All you have to do is appear. That angel appeared, and my daughter said, “Aaahhh!” and from that day to this she hasn’t taken any more dope. God has his own way of doing things. He spoke the world into existence, and He has all knowledge. His ways may be a little different from yours, but believe me, your case is not too hard for Him. But you need to learn to put first things first. Sure you need to love God. The woman with the demon-possessed daughter loved God from the very beginning or she wouldn’t have been looking for Jesus. If you love Jesus and believe He has the answer for you, you had better be looking for Him. She was looking for Him. She had faith in Him. She loved Him. And she found Him, but she made the wrong approach. She didn’t put first things first. All some people say is, “Give me, give me, give me, Jesus. I’m in trouble, Lord. I’m sorry. Give me, give me, give me.” If you think like that, I’ve got news for you. Jesus is not a give-me Jesus all the time. Jesus’ heart overflows with an abundance of joy when He sees you bow down before Him and worship Him. You may need a blessing from God. You can have it, but you must put first things first. You must worship Him. Speak His name out of your mouth. It’s what comes out of your mouth that defiles you, not the things that go in. Let worship come out of your mouth. Say, “Jesus, I worship you. I love you.” Don’t ask Him for anything right now. Just worship Him first. Sometimes the Spirit of God will come upon you and heal you even before you ask. God knows what you have need of even before you ask. (Matt. 6:8.) Your child may have been saved while you were worshipping Him. Remember you can start and stop worshipping Jesus any time you want to. Don’t wait until the Spirit of God comes upon you to worship Him. Don’t worship Him based upon your feelings. Worship Him because He is God. Worship Him because He died on the cross so you could be saved. Worship Him because He is the Lord of your life. That is what the woman thought, “I have a devil-possessed daughter. I’ll just go ask Him.” But He wouldn’t even talk to her. Her first approach didn’t work because she failed to put first things first. If your approach to God is not working and you’re not getting healed and your children aren’t getting saved then change your approach. You love Him, and He knows you love Him, but some of you haven’t been worshipping Him enough, and you’re cutting off the blessing. God says in 3 John 4, I have no greater joy than to hear that my children walk in truth. And when they do, they’ll get a blessing from heaven. He wants to give it to you. He wants His power to shoot into Los Angeles. He wants His power to go into New York City and deliver that child of yours. “Brother Norvel, do you think if I’m faithful to worship Jesus that His power will go to my child and run all the devils out?” someone may say. usually doesn’t tell when He is going to do something. If He does, it’s a supernatural manifestation just for them, but He usually doesn’t. When you put first things first, you have a right to ask Him to save your child. You have a right to ask Him to heal you and set you free. You have a right to have your home back together again. Jesus plainly told you and me, Whatsoever ye shall ask the Father in my name, he will give it you (John 16:23). Why? Because the Father loves the name of Jesus. The Father loves His Son. His Son is the One Who came to earth and paid the sacrificial price that you and I may be saved. If you want to please God Almighty, the Creator of all the universe, if you want to please him, worship Jesus; have faith in Him. When you worship Jesus, He will walk into the throne room and say, “Father, that woman down there who is sick and has a devil-possessed child has been worshipping me. “How long has she been doing it?” God might say. “She’s been doing it for a week,” Jesus might say. “She might just be doing it to get Me to manifest Myself because they need help but aren’t really sincere in worshipping Me. I’m not interested in that gospel game,” God might answer. Time will always bring out the truth. Anybody can have patience with God for a week. Anybody can put up a front for a month. Anybody can stretch their imagination and go to church for three or four months. But, remember, God won’t buy those phony tricks. He already knows those tricks. God will give a test. He Wants to see how long the person will worship Him. The key is: Don’t give up. Just keep on. Some people have been born again twenty years, but they’ve never turned their lives over to Jesus. It’s one thing to give your heart to Jesus, but it’s another thing to give your life to him. People give their heart to Jesus because of conviction or because of a sermon or because they want to stay out of hell. down for Him and give Him anything you’ve got. “Yes, that’s right.””Then show Him you believe in Him. Show Him you love Him. Worship Him and pay your tithe. Thank Lord God for a good wife. Thank God for a good husband. Thank Lord God for peace in your home. Thank Lord God for your children being saved. Thank Lord God for a good church. Thank Lord God for your healing. Now if you have given thanks to God, I have good news for you. If you are a pastor make special note of this. I’m going to give you a perfect definition of faith. I’m going to let you know exactly what faith is. Anything you can thank God for out loud before you see it Jesus will let you see it. Faith is not seen. You have to thank God for it before you see it. Thank God for what you asked Him for out loud. Thank You, Lord, for my healing. Thank You, Lord, because Your presence is in my house. Thank You, Jesus, for saving Elizabeth, Tommy and John. Thank You for putting my home back together. bed and worship God. Lay your hands on his pillow. Say “When he sleeps in this bed, let the Spirit of peace come into him. Let the Spirit of respect come upon him.” You would be surprised what the Holy Spirit will do with him. Whatever you can thank God for before you see it, Jesus will let you see it. Do you believe the Lord is going to heal you sometime? Do you believe He’s going to deliver your child sometime? He’s not going to do it because “sometime” never comes. God is a now God, and faith is right now. There is no such thing as “if God doesn’t do it.” If it is a promise to you from the Bible, there is no such thing as “if God doesn’t do it.” Get that out of your mind, out of your vocabulary. If that is how you pray, you might as well punch the balloon and walk off. I can tell you right now God isn’t going to do the miracle for you. Don’t walk around saying, “If God doesn’t do it, I guess I will just have to suffer.” Put on your “suffering clothes” then, because that is what you are going to get! If you want God to do anything for you, you’ve got to show Him that you have faith in Him. Worship Him, ask Him, then thank Him. Show Him this afternoon. Don’t wait until tomorrow. He wants to manifest Himself to you today. He wants you to accept Him right now on the basis of your faith.